It is important to identify bees and wasps living near your home. Wasps are often mistaken for bees, and vice-versa. Positive identification is key to solving any problems along with proper products and protective equipment to insure effective results. Bees are flying insects closely related to wasps. They are known for their role in pollination and for producing honey and beeswax. The various species of wasps fall into one of two main categories: solitary wasps and social wasps. Adult solitary wasps generally live and operate alone, and most do not construct nests. Social wasps exist in colonies numbering up to several thousand strong and build nests. 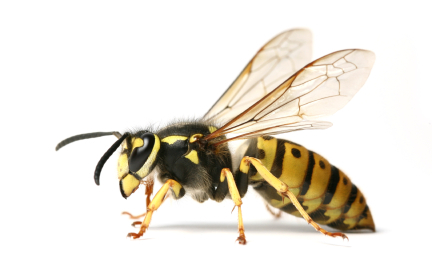 Yellow jackets are a type of wasp. They are about ½ inch in size (similar to a honey bee). All females are capable of stinging. They have a lance-like stinger with small barbs and typically sting repeatedly. It belongs to the genus of wasps called yellow jackets. They are best known for their large football-shaped paper nest, which they build in the spring for raising their young. Bald-faced hornets are extremely protective of their nests and will sting repeatedly if disturbed. The nests can reach three feet tall.